I’ve been a big fan of spicy tuna rolls for many years. They drove me crazy until I figured out the secret ingredient: sriracha hot sauce, the Thai stuff you see on the tables at Vietnamese and Chinese restaurants. Some of the upscale sushi places use the traditional Japanese hot spice mix called togarashi (7-spice powder), but more often than not, the red stuff is sriracha, which is widely available at Asian markets and even some chain grocery stores. For sushi in Eugene, you really can only profitably eat at Sushi Domo, a neighborhood Japanese restaurant in town that is rather out of the way, unpromisingly tucked into a strip mall between a Wal-Mart and a Goodwill. The sushi, surprisingly, is good, not great, a solid B+ performance. That’s not bad for sushi in Eugene, to say nothing of Eugene restaurants in general. And the menu features something delicious and unusual, what they call a crunchy spicy tuna roll. Usually, I hate the fancy rolls because they are a mishmash of flavors, are either brushed in teriyaki sauce or topped with Japanese mayonnaise, one of the foulest concoctions ever. And I’ve had crunchy rolls elsewhere that were not as good, or, egads, crunchy because they are rolled in batter and deep-fried. But this crunchy roll was delish. The little crunchy bits of tempura batter were integrated into the spicy tuna, tiny and subtle, just adding a bit of texture. The crucial thing for home sushi is to get the freshest fish possible. It’s best to go to a fishmonger. Don’t assume that all fresh tuna is sushi-grade (or more technically correct, sashimi-grade, since “sushi” refers to the seasoned rice). Also, please don’t put mayonnaise on sushi; some restaurants now skip a step and just glop some srirachi-flavored mayo on top of a tekka-maki or tuna roll. I don’t even like it in the sauce for spicy tuna rolls. 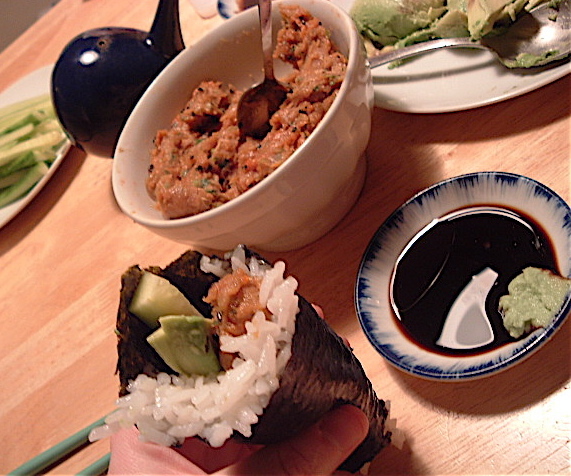 If you need a recipe for sushi rice or how to roll sushi, google is your friend. 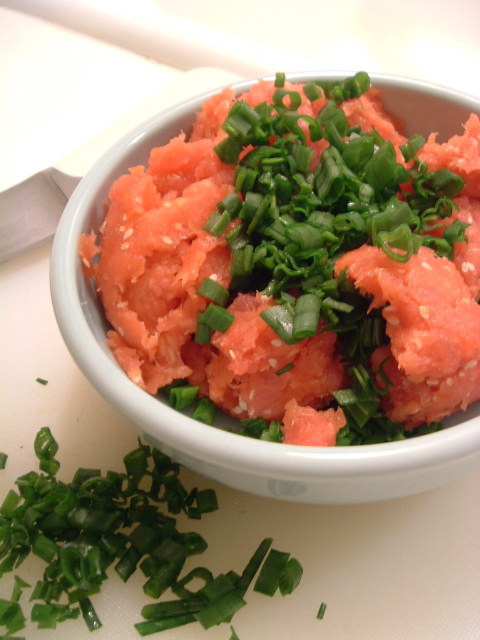 Cut tuna into 2-inch cubes for food processor. Add to food processor and pulse until chopped roughly. (The mix in the photo was processed a bit too much so it was paste-like, and that really ruins the texture.) Place fish into bowl and mix with other ingredients. Taste for spiciness and salt. Serve in rolls with avocado and/or cucumber. Another alternative is to serve without rice: use thinly sliced cucumber wrapped around a bit of spicy tuna mixture, secured by a toothpick. Thanks for the secret tip! By the way, Sushi Dumo is our favorite sushi place here too. But it’s Korean, not Japanese. A Korean friend of ours said that “Japanese sushi looks good, and Korean sushi tastes good!” She and her husband always ordered Chirashi there. A tasty bowl of raw fish, rice, veggies and a ton of red sauce. You take this lovely looking bowl of food and mush it up. They even serve it with a spoon so you can stir it sufficiently. I can’t imagine something less Japanese! Not into Kewpie mayo? It seems like a hit or miss for some people but I think the Japanese have it right in thinking it’s an awesome junk food. It’s so much better than American mayo and I can’t imagine not having it in a spicy tuna roll. Do you know what’s in Kewpie mayo? No, neither do I. :/ Next to natto and kare raisu, I find that stuff one of the worst representatives of fresh, subtle Japanese food, honestly. And if you’re paying for sushi, why junk it up? I think the spices in spicy tuna highlight the flavor of the tuna — the mayo obscures it. Which is why they use it in cheap sushi joints. But you’re certainly entitled to your opinion! Oh, and Annie, you can get chirashi in the Japanese style elsewhere — no red sauce, no mushing up. It’s just a layer of myriad fish atop seasoned rice. Yum. Greg: Yes, obviously I am completely ignorant. But I can kind of see your suspicion of it’s not-being-Japanese. If Sushi Domo is a Korean-run establishment, chances are they serve their chirashizushi a bit more like Korean bibimbap, which is a bowl full of rice, veggies and a meat with a spicy, red gochu sauce that you mix together. If they’re serving their chirashizushi with the gochu sauce, then it definitely isn’t authentic. Aside from oil and egg yolk, there’s MSG in kewpie! That’s what puts it a grade over awesome. Everyone is always ragging on MSG but it’s really not that bad. Use a little bit to bring out the natural glutamate in food. Umami is what Japanese food is all about! Yum! I am looking for the recipe to a spicy tuna sauce that is spicy yet sweet with sesame seeds in it. It does not look to contain mayo but instead almost like a fruit paste?? Found this excellent recipe after all my usual food haunts failed me. 20 minutes and five ingredients later, perfect “Spicy Tekka-don”. So first of all, that Chirashizushi at that Korean place is actually Hwe dup bap, literally “sashimi-bowl rice.” Delicious. It’s pretty much as JiHye describes. Chirashizushi doesn’t require mixing. Also delicious. Other differences are no vegetables or sauce, but usually some kind of roe. I like the kewpie in spicy tuna, but if we’re talking about inauthentic, adding spicy sauce is already pretty out there. half parts soy sauce and mayo. No mayo needed, and in response to margaret suggesting MSG is good for you, or not bad… MSG burns holes in your brain. Hummm … OK, since this post is not yet dead, I think I’ll add a note, and perhaps get it back on a more positive path. If there is a thread of connectivity in this discussion, it is that the American taste for foods Japanese is all over the map – and rather than frustrating, I find that fact fascinating – it simply means that we are all in ‘discovery’ mode, and acquired tastes are still acquired. I have grown to be a lover of raw fish, although I still resist a few for textural reasons – but I’m always very amused to hear others relate their tales of the first time they ate a piece of raw fish – they always are so self-effacing, as is my own – many many years ago (early 80s) a friend and I determined that we’d learn how to eat raw fish by going to a sushi joint and ordering a large assortment of sushi rolls, which we had heard were easier to eat than regular sushi itself – but in our ignorance, we had confused the proper generic term for the rolls (Maki) with Sashimi – and so we ordered Sashimi (hey, this was a long time ago!). As we sat there in shock, and drawing the attention of everyone else in the restaurant (at least that’s the way it felt), we felt compelled to eat as much of the fish as we possibly could – I remember well that I did my best to get almost half of that HUGE assortment down before we requested ‘To Go’ containers for the rest – which I remember I cooked up for lunch the next day – I was still in shock. I suppose that’s the trial by fire approach, but it worked – today I prefer even my cooked fish to be a little underdone – and Ahi must be seared on the outside, and raw in the middle. And no mayo, thank you. Ha ha…I had a similar experience to Drfugawe….was being treated to Japanese food & ordered sashimi, thinking it would be good to try a “little” raw fish. I hid my dismay when the waiter arrived with this (seemingly) huge platter of raw fish! I bravely dud in and managed to down it all, not wanting to seem rude to my host…I’ve been a raw fish fan ever since! Loving your blog, I grew up in the Eugene area, looking forward to trying some of your recipes!